This week I’d like to welcome Destiny Allison, author of an autobiographical book called Shaping Destiny, to the hot seat of my Thursday Throng interview. Destiny is a self taught sculptor living in Santa Fe who struck a chord with me because of our shared interest in empowering women. As well as doing this interview, Destiny is also giving one lucky commenter a signed copy of Shaping Destiny. Shaping Destiny is the inspiring story of Allison’s life from the creation of her first sculpture to her acceptance into a prominent Santa Fe art gallery. The book, which recounts her journey from traditional female roles to self-actualization and independence, is told with three voices: the emotional, the intellectual and the instructional. Though she had no formal training, Allison moved quickly from small, Plasticine clay sculptures to an apprenticeship at a foundry to teaching in a small museum. Along the way, the author wrestled with shedding and then reclaiming family. To add to the extended metaphor binding her story to the theory and language of sculpture, Allison infuses an ample dose of popular philosophy in lessons culled from childhood days spent with her father. The 22 lessons at the beginning of each chapter intend to guide readers’ passage through the complexities of clay and life; each lesson works with the idea that art is a process, as is life. When I was first asked if I might host Destiny here on Woman on the Edge of Reality and write a review I was initially sceptical, after all this is the autobiography of a living artist and, with the best will in the world, there is no way anyone would ever be able to accuse me of being an art lover. I visit the odd gallery or two, I love some museums, but I prefer my art to be something I can understand easily and not something I have to work at to understand. However, I read the first chapter and was hooked. This is because, as someone that works with women for a huge part of my working day, Destiny accurately captured what they say and feel; and what they share with others in the same boat. What I found as I carried on reading was that this is not so much a book about Art, but about how Art became the means of self expression of a woman who didn’t understand how to change herself and her life. It’s certainly not an easy read though and it’s challenging in many places, mainly because it makes you think about yourself and your own expectations and experiences of life; as a result some may find it a difficult read. You don’t have to be an artist to appreciate the book, but I do think you need to be open to putting your own life under the microscope to really get the full benefit of it. And so, to the interview. I am fundamentally shy. No-one knows this because in addition to my honesty in Shaping Destiny, I live most of my life in the public arena and am known for my public speaking, community building, and activist endeavours. The truth is that all of these are painful for me, even though they are absolutely necessary to who I am and what I believe. I have to conquer my shyness so that I can share my writing and my art, and so I can engage with people at the level I do on a daily basis. It is one of my biggest challenges. I loved the review from Rachel. Rachel recently graduated from high school and didn’t agree with me on some philosophical points. Still, her willingness to think, feel, and challenge were enthralling, especially for someone so young. I hope many readers engage with the book on this level. This might be from the same review. Rachel goes on to challenge me from a religious perspective. “All I have left to say is that Shaping Destiny, ultimately, revealed to me that Destiny Allison does NOT understand the meaning of life and faith.” Ouch! Absolutely. In addition to the peril of sitting for hours in front of a computer screen (think unwanted pounds, squinty eyes, hair loss – yes, I have actually pulled some of mine out) web statistics pose a real threat. While not dangerous in moderation, checking blog stats, social media and Amazon book sales can lead to excessive alcohol consumption, erratic mood swings, and even clinical depression. Do you mean this literally or metaphorically? If literally, the answer is occasionally – mostly in the middle of the night, or first thing in the morning. If the intent is metaphorically, I try to write naked all the time. Wow, that’s a really hard question. How do I narrow it down? Was it the first time I gave birth, or the second? Was it the day of my wedding, or was it last night when I viewed a sliver of a moon through half-closed, sleepy eyes while my husband pulled me closer and whispered his love into my hair? Is it possible to weigh one powerful, magical, beautiful experience over another? Could I choose between cool, still dawn and glorious sunset? I try to live each moment, each experience, as fully as possible. I’m greedy. I want them all to be the best. I am much saner when I am working then when I’m not. Writing and art are like breathing for me. I have to be creative. When I’m not working, I’m not much fun to be around. Everyone has heard the mantra, “Keep writing,” a thousand times. It is true. So is the need for discipline. In addition, aspiring writers should never give up their dreams of success. Success doesn’t just happen. You don’t get discovered. If you want it, fight for it. Get down in the trenches. Talk to everyone. Believe in yourself so much that you become contagious. Learn the business. Learn the marketing. Do the hard work. It does eventually pay off in book sales, but it also pays off through the friendships you develop. Finding the community that is right for you is as important and rewarding as finding the reader/agent/publisher who loves your book. In the morning, tea. In the evening, wine. In the middle of the night, I love my whiskey. 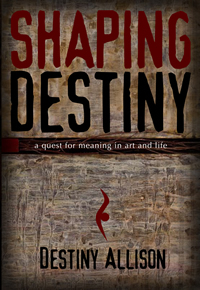 If you would like to get a copy of Shaping Destiny then you can find it on Amazon in the UKand on Amazon in the US too, you’ll also find my reviews of Destiny’s Book on Amazon in the US, the UK and on Goodreads too. interesting, as father of a daughter in art school — some people must follow their muse. I think we all follow our muse in some way. Maybe your passion is fishing or gardening, biking or swimming. It doesn’t matter where you put your heart and soul. You are still following the muse and working on the greatest work of art of all — your life. yes, living richly is a form of art. Perhaps it only leaves memories… but that’s ok too. I don’t think we do, we are all equipped to do so, but we compartmentalize our lives and limit them… if feels much safer. I always felt a part of genius was full engagement, for better or worse. laughing — two phrases are always a warning for a man…. What an amazing interview. Destiny has paid keen attention to the process that brought her to where she is now. Thank you, Destiny, for sharing your “adventure” in art. I am not sure I can write…….. between your interview, Linda, your chat about the book, the book trailer, Destiny’s FB page, and website, I feel as though I have been shaped just a little, or a little bit more than that….. I could listen to Destiny’s words in the book trailer over and over again, (I have already listened to it multiple times, and added it to my youtube subscriptions!!). My ‘extensive’ to-read shelf on Goodreads is now one book heavier; and I await Destiny’s next ‘tweet’. My first question is: ‘Is Destiny your real name?’ Kind of gives me the shivers to think you were pre-destined for this work. You know when people ask what your favourite number is, mine is 22. Please enter me into this Giveaway. Thank you both for your generosity. Thanks for the lovely words. My real name is Destiny. I was unexpected, my parents thought I was going to be a boy, and my father lost some family members right around the time of my birth. I was baby girl Allison for about two weeks before he announced one day that I was Destiny. It is a name I cherish, though it is sometimes hard to live up to it! Contrary is the Weekly Word: What’s your alternative meaning?